My first morning was spent with Marina de Zarak, Jorge's aunt, as she showed us the best places for crafts and souvenirs, including "Salsipuedes" - 'Leave, if you can'. 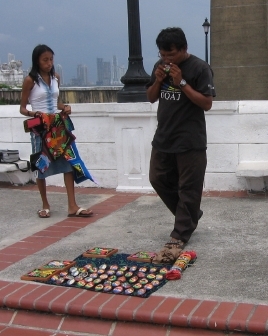 See the polleras and tembleques she makes at Panamapolleras.com. 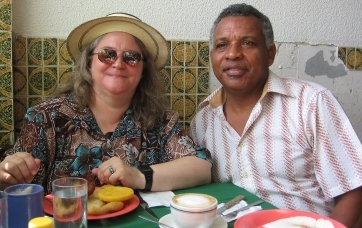 Here I am at breakfast with our friend and taxi driver Rodolfo Bethancourt (No. 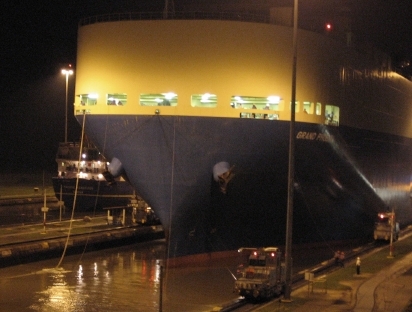 9818). If anyone needs a recommendation for a driver during a visit, contact me! 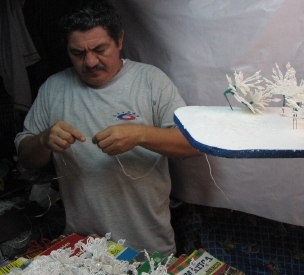 This man is making and selling 'tembleques', the beautiful folkloric hair ornaments.. 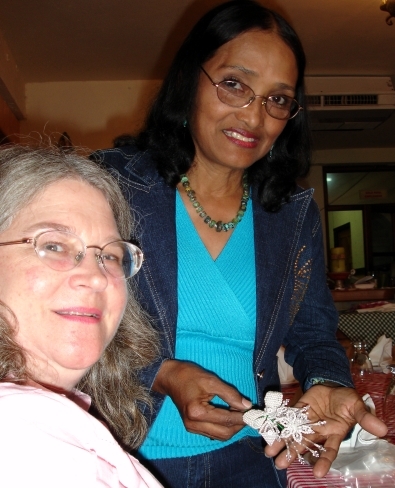 Here Marina is presenting a gift to me (on HER birthday!) 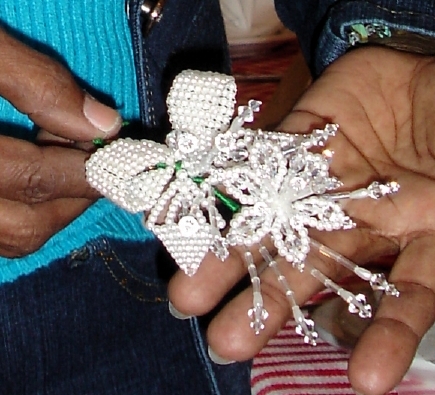 of a tembleque corsage which she had made that morning, "number 1 of 1." I was incredibly moved! What a lovely gift, which I treasure. 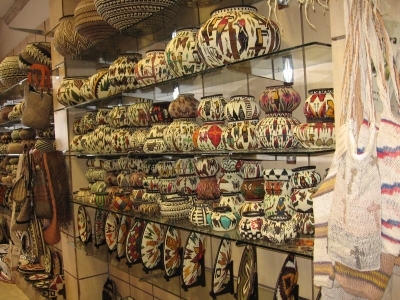 And woven baskets and string bags from a different indigenous group from, I think, Bocas del Toro. We also squeezed in some actual historical locations and monuments! 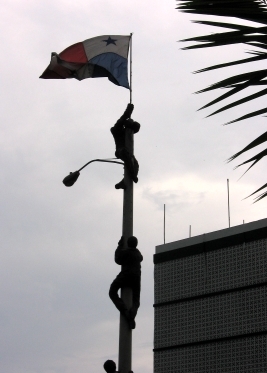 We visited the Monument to the Martyrs, showing three figures climbing a lampost to raise the Panamanian flag, commemorating the events of January 9, 1964. 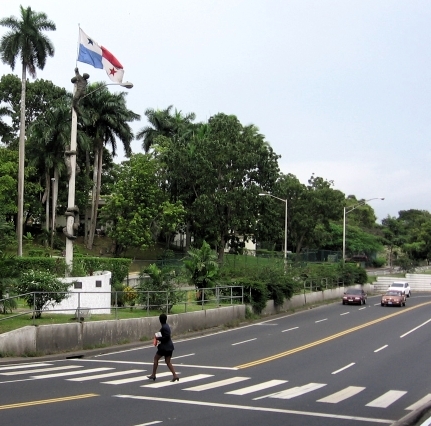 To get there we had to cross Avenida de los Martires on the "crosswalk of death" - sprinting between 4 lanes of onrushing vehicles. 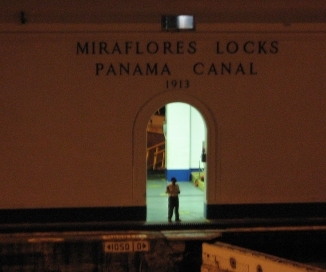 Also commemorating those events was the memorial at the former Balboa High School building in the former Canal Zone, now the Ascanio Arosemena Training Center. 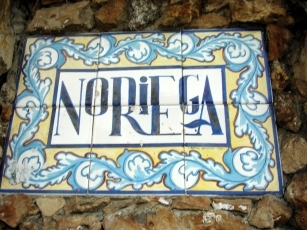 In the center is a simple pedestal marked with N, S, E, W for the directions of the compass. 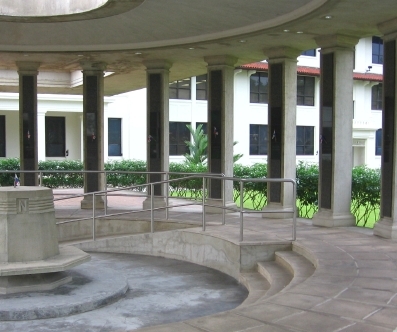 Each column is engraved with the name of one of the 21 who died during these events here. There are more photos at my January 9 1964 page. 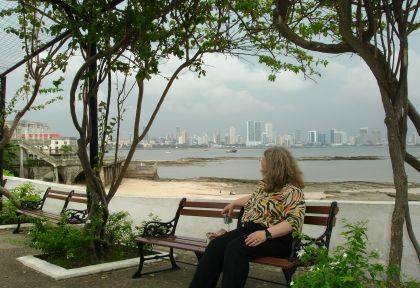 At left is Plaza Francia, at the tip of Casco Viejo. 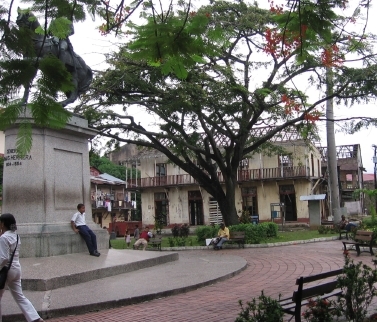 At right is the actual statue at the center of Plaza Herrera. 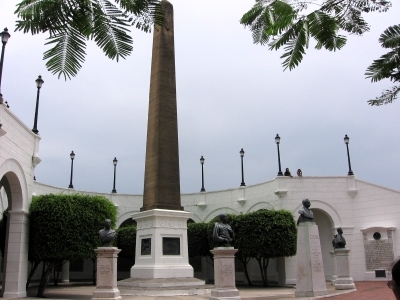 The song named "Plaza Herrera" is on the album Antecedente. 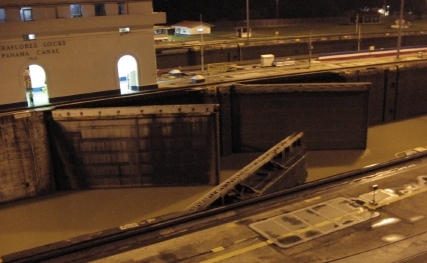 We had an amazing view of the locks, right below us. 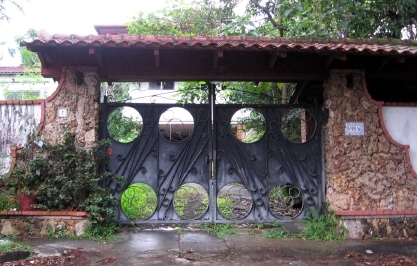 We also drove by the Noriega property, all overgrown and in disrepair.